With an overall length measuring right at 18 feet, the Novurania 550 Deluxe model is more than just a typical yacht tender. With power options up to 115 horsepower, the 550 DL model enters into sport-boat territory that smaller tenders do not have the size or speed to entertain. The 550 DL lends itself well to being trailered. Coming in at less than 2000 pounds fully fueled, and with safety gear aboard; the 550 DL can be towed by almost any vehicle with a tow hitch. A family sedan or small suv can now take the inflatable with the family, on their vacations. No more need for a large truck just to tow the boat along, or the need to rent a boat when you get to your destination. With its 22 gallon, EPA compliant fuel tank, the 550 is ready to spend all day away from the dock or yacht. Load it up with up with your entire family, and all the toys you could ever want, and the 550 DL will effortlessly transport you in comfort and style. Optioned out with a ski tow pylon, the 550 DL can easily pull a water skier up, even when on a slalom ski. It can easily pull two wake-boards or knee boards, and is up to the task of pulling any inflatable water toys. It has enough deck and storage space to easily accommodate divers, with or without tanks. And with multiple ladder options available from transom mount, to over the tube styles, anyone can easily board the boat from the water. Entering from the water or beach, passengers are greeted with an available below deck, pressurized, 9 gallon fresh water shower system. Just the thing on a hot day, for getting the sand out of your toes, and salt out of your eyes. If you need your tender to be independent of the mothership, or you are looking for an Inflatable option to explore your local bays and islands; the 550 DL can be outfitted with a full electronics package, with only your imagination limiting the choices. Stereo packages, VHF radios, depth sounders, fish finders, GPS and chart plotters, with down view and side scanning sonar. Even 12” flat screen panel displays and radar packages are options for the 550 DL. Novurania even has an optional radar arch with mounts, for twin remote controlled search lights. Handsomely equipped, even the stock boat has a full stainless steel package, consisting of a bow-rail with navigation light and 6 inch Herreshoff cleat, high profile wrap around console rail with windshield, and a leaning bolster which mounts two additional 6 inch cleats. The bolster allows the helmsman and up to 2 passengers the ability to sit high above the waterline for a clear view, or lean against the bolster cushion for more spirited maneuvering. A low profile version of the 550 DL is also available, for those customers who have need for a lower profile to complement their yachts lines, and for those whom simply prefer a sleeker look in this length boat. This package replaces the stainless steel package, which comes as standard. The bow rail is replaced with a fiberglass bow step; for stepping off from the front of the tender to floating docks, and to the shore, when beached. The windshield is deleted, and the high profile console rail is replaced with a low profile model, which wraps in closer around the perimeter of the console itself. The leaning bolster is replaced with a stainless steel framed backrest, where the helmsman can sit comfortable while piloting the boat. The console on the low profile model is reduced by 3 inches, and with the tilt wheel, offers excellent forward viewing. Standard colors for the 550 DL are white hull, deck, and console, along with white Hypalon tubes. The customer has their choice of Grey, Navy Blue, or Moka trims at no additional charge. The Novurania upholstery even has accent inserts in their cushions, which complement the trim color chosen. The 550 DL tender can be built to match your yacht, with optional gel coat, upholstery, and tube colors available. Novurania also offers custom laser cut logos, to match the name and logo of the yacht. 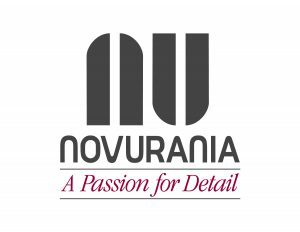 Contact Novurania at www.novurania.com, for a full list of standard and optional equipment available for the 550 Deluxe tender.